It is very likely that in addition to attending your work placement you will be expected to undertake certain assignments in order to gain full credit for your endeavours. Moreover, even if no assignments are set, students may like to consider tackling one or two on a voluntary basis, since this will help personal development by clarifying and organising thoughts and observations and illuminating the learning outcomes. As the requirements tend to vary from one institution to another, it is very important to be clear about what is expected from you. 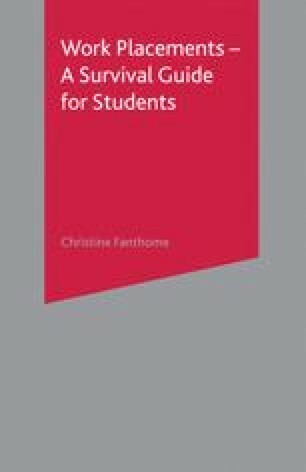 The following guidelines offer suggestions as to how to keep a learning log or diary, write a reflective essay and report and give a presentation, as these are assignments that are commonly associated with work placement modules in many universities. However, it is of course essential that students ensure that the work they submit conforms precisely to what is required by their particular institution. The methodology suggested here may need to be amended in order to ensure that the assignment fulfils all the criteria and requirements of the university.